The blade called Kuronbogiri (黒ん坊斬り・くろんぼ切, see picture below) is the most famous work of the Bizen-smith Kagehide (景秀). Kagehide was, according to tradition, the younger brother of Osafune Mitsutada (光忠) and was active around Shōgen (正元, 1259-1260). 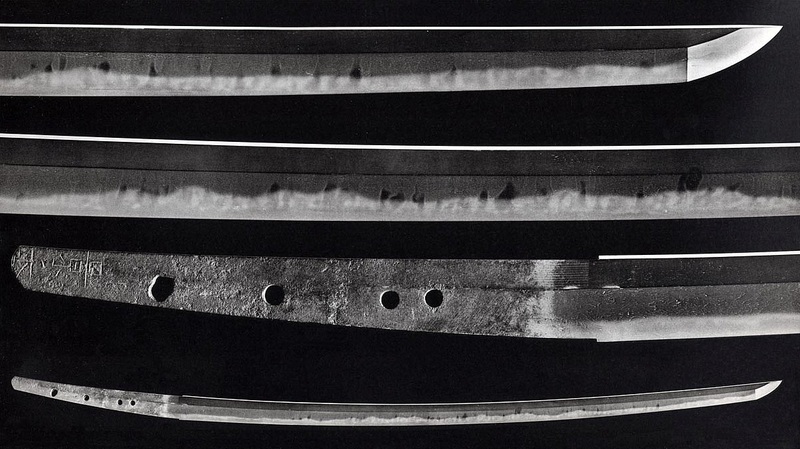 The blade itself is a tachi measuring 73.0 cm which was shortened up to the signature. Originally it was a heirloom of the Ishikawa family (石川) who were a local political authority of the northern Ōshū region since the Heian period. During the Sengoku period they allied themselves with the Date (伊達) and were later amonst the major vassals of the powerful warlord Date Masamune (伊達政宗, 1567-1636). So maybe it was in this context that the sword came into the possession of the latter. The smith Tamateru (玉英, ?-1862) who worked around Bunsei (文政, 1818-1830) for the Date-controlled Sendai fief (仙台藩) lists the Kuronbogiri-Kagehide in his publication Wakan Tōken Dan (和漢刀 剣談) under the name Kuragiri-Kagehide (鞍切り景秀, lit. “saddle-cutter Kagehide”). He writes that Masamune killed with such a powerful blow a Korean general with this sword that he split him from the top down to the saddle. It is possible that this tradition was more known amongst the samurai of the late Edo-period Sendai fief than the story of the executed Korean man with the dark skin. Anyway, as befits a man of his position, Date Masamune also had a respectable sword collection of which I would like to introduce some pieces in the following. One of them was the so-called Ashina-Kanemitsu (芦名兼光), a tachi with a nagasa of 72.7 cm which was forged by the same smith as the Takemata-Kanemitsu. This sword was once owned by the Ashina family (蘆名),*1 the arch rivals of the Date. In the 17th year of Tenshō (天正, 1589) Masamune took advantage of succession disputes within the Ashina family and captured their castle Kurokawa (黒川城). Contemporary reports say that more than 2.000 men were killed at that time and many swords were destroyed. But the most important treasure sword of the Ashina, the mentioned tachi by Kanemitsu, was rescued and handed over to Masamune as spoils of war. The latter presented it shortly after to Endō Munenobu (遠藤宗信, 1572-1593) for his great achievements on the side of the Date. A tradition says that the Ashina-Kanemitsu went to Munenobu´s father Endō Motonobu (遠藤基信, 1532-1585), but four years earlier Motonobu had followed his lord Date Terumune (伊達輝宗, 1544-1585) – Masamune´s father – in death at the fall of Kurokawa Castle. Chronicles of the Date family note that Masamune wore later „at home“ in Sendai Castle (仙台城) either the Kuronbogiri-Kagehide, the Habaki-Kuniyuki (鎺国行), or the Watari Rai Kunimitsu (亘理来 国光). It is said that the Habaki-Kuniyuki has its name from the fact that the swordsmith Rai Kuniyuki forged the blade in one piece with its collar (habaki, 鎺). Later, when the blade was shortened to 72.1 cm, the steel habaki was lost but a two-layer “substitution” or “tribute piece” was made of gold which showed sukashi openings in the form of the characters Kuni and yuki. At the time of Date Tsunamura (伊達綱村, 1659-1719) the Hon´ami issued an origami for this sword with the incredible high value of 100 gold pieces. The tradition says that it came into the possession of the family as a present from Hideyoshi. The Watari Rai Kunimitsu was once owned by the Watari family (亘理) of the same name who competed with the Date in the Kamakura period for supremacy in the northern Ōshū region. But the latter were victorious and the Watari were assimilated into the Date family towards the end of the Muromachi and beginning of the Edo period by marriages and adoptions. The Watari Rai Kunimitsu has a nagasa of 73.2 cm and was particularly worshipped by the sixth Sendai-daimyō Date Munemura (伊達宗村, 1718-1756). The Date family also owned a sword from the former possessions of the Usami family (宇佐美) who were introduced in this story. The piece in question is the meibutsu Usami-Nagamitsu (宇佐美長光, see picture below). It was once worn by Usami Takatada (宇佐美孝忠), lord of Biwajima Castle (琵琶島城) in Echigo province. It is said that he cut through the hilt of a yari and right through the skull and mouth of an enemy with this sword. When the Uesugi became military governors (shugo, 守護) of Echigo province the sword came into the collection of Uesugi Sadazane (上杉定実, 1478?-1550), a nephew of Kenshin. Some years later, more precisely in the eleventh year of Tenbun (天文, 1542), Date Tokimunemaru (伊達時宗丸, 1527-1587) was nominated by Sadazane as his successor and everything was arranged for the political marriage and adoption. He received the “Uesugi-name” Sanemoto (実元) and the sword Usami-Nagamitsu but his older brother Date Harumune (伊達晴宗, 1519-1579) thwarted the plans and the adoption was never carried out. But the sword remained with the Date family and later became the favourite piece of Masamune´s second son Date Tadamune (伊達忠宗, 1600-1658). From a note of an unknown author we know that the Usami-Nagamitsu was shortened to the present-day katana size of 74.2 cm when Tadamune had it mounted into an uchigatana-koshirae. “It would be an honour for me,” replied Masamune and the sword was handed-over. After re-sheathing the blade he gave it back to Hideyoshi with a deep bow: “Truly a masterwork!” “If you like it, I will offer it to you,” said Hideyoshi unexpectedly and of course Masamune agreed. The very next day they arranged a meeting to the south of Kyōto as Hideyoshi had to inspect the rebuilding of his castle Fushimi (伏見) after it had beed destroyed in a major earthquake in the seventh month of that year. One of Hideyoshi’s escorts saw how Masamune proudly wore the eye-catching sword in his belt and shouted: “He has stolen the sword of our lord! Get it back!” The nearby samurai started to run towards Masamune but the latter was able to leave them behind. After a short moment of shock the confusion was cleared up and the attentive man was of course not punished. Some time later Date Masamune argued with a servant whose name is not known. The servant hid behind a huge bronze candle holder (shokudai, 燭台) but his lord was so upset that he cut in half the candle holder and the poor devil crouching it with his sword. Thereupon he nicknamed the blade Shokudaikiri-Mitsutada (燭台斬り光忠, lit. “candle holder-cutter Mitsutada”). When Tokugawa Yorifusa (徳川頼房, 1603-1661), the first generation of the Mito-Tokugawa branch, stayed at the Date residence some years later, Masamune told him about the story of the Mitsutada and the candle holder and showed him the sword in question. The sword chronicle Buko Tōsan (武庫刀纂) of the Mito-Tokugawa family says that Yorifusa “fell undyingly in love” with the blade and mentioned frequently and emphatically that he wanted to have it. When this wish was not granted it is said that he acquired it by force and fled to his Edo residence, i.e. far away from Sendai. Incidentally, Yorifusa held a grudge against Masamune. When he was promoted to the third court rank lower grade (jū-sanmi, 従三位) on the 19th day of the eighth month of Kan´ei three (寛永, 1626), the same rank was given to Masamune too. 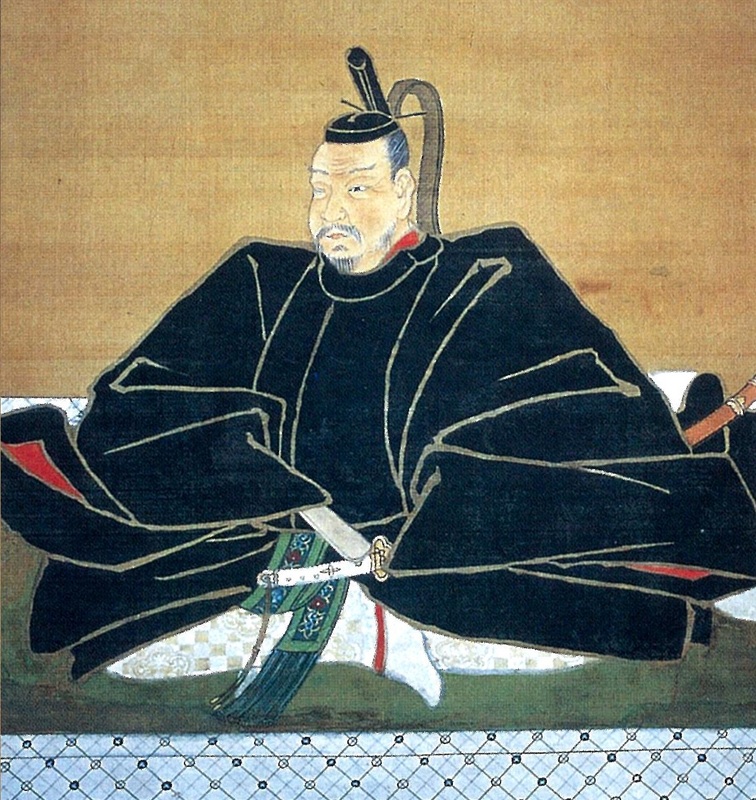 According to tradition Yorifusa was very upset because he was related to the shōgun family and should have received a higher court rank than a daimyō. So he complaied to the competent court official and one year later he received an “urgent promotion” to the third court rank first grade (shō-sanmi, 正三位). *1 The family name Ashina can be written with the characters (蘆名) and (芦名). However, for the family the former and for the sword the latter became naturalized. *2 Mitsutada is regarded as the founder of the Bizen-Osafune school (備前長船). He was active from around Ryakunin (暦仁, 1238-1239) to the early Bun´ei era (文永, 1264-1275). He was the father of Nagamitsu.